Over the next month, we at IDA will be introducing our community to the filmmakers whose work is represented in the DocuWeeks™ Theatrical Documentary Showcase, which runs from August 3 through August 30 in New York City and Los Angeles. We asked the filmmakers to share the stories behind their films—the inspirations, the challenges and obstacles, the goals and objectives, the reactions to their films so far. So, to continue this series of conversations, here is Dafna Yachin, director/producer/writer of Digital Dharma: One Man's Mission to Save a Culture. access to the story of a people. Dafna Yachin: Unlike many of the fantastic recent film school directors I am meeting at the festivals this year, I started as a field, then series and show, producer/director for both network and cable. I then worked my way into becoming a commercial film director and now chief creative officer for Lunchbox Communications. Lunchbox has always helped human rights nonprofit organizations tell stories cross-platform. And while we had grown into a marketing and branding firm, we all came from storytelling backgrounds and are compelled to help organizations and causes create epic films that would not be short-lived, but would last a lifetime to help record history and motivate an audience to action. IDA: What inspired you to make Digital Dharma? the first English translations of many Tibetan books, 100,000 Songs of the Milarapa. I was told Gene had digitized thousands of 1,500-year-old Tibetan bats, though I was not sure what a Tibetologist did and was clueless as to what a Tibetan bat was. Over the next year, I ran into Gene several times at human rights events. I'd ask him how the digitization efforts were going and he'd tell me about some collection that was just realized in Mongolia, Bhutan or in the bowels of the Library of Congress right here in the US. His passion was infectious. I kept picturing ancient texts locked away in crates on forklifts, like an Indiana Jones ending. I needed to get more of this quiet and humble, unlikely hero on camera. texts lost during China's cultural revolution. We wanted to be there when these spiritual leaders discovered that 1,500 years of history could fit into the palms of their hands. With this feature film, I want viewers to quickly move from asking why to wanting to learn how: how Gene's ultimate mission of collecting, digitizing and distributing all the texts will be accomplished, and perhaps even how the viewers might become agents for accomplishing such a purpose in their own lives. Third...finding a way to translate a complex topic for a mainstream audience and distill 50 years of E. Gene Smith's mission and 1,500 years of Tibetan history into 82 minutes. DY: Gene Smith was so humble; he did not want this film to be about him. He wanted it to be about all the lamas, scholars and laypeople that he had worked with over his lifetime. 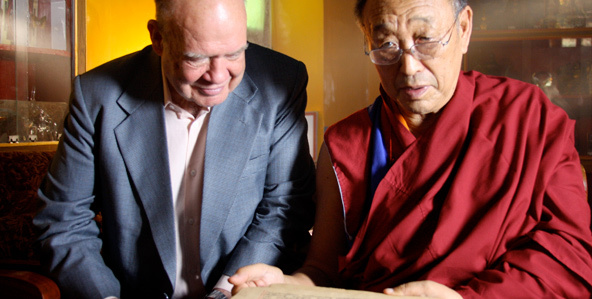 We were originally going to make the film about the text-preservation efforts and the Tibetan Buddhist Resource Center that Gene had founded. When Gene passed away suddenly during the making of this film, we lost a close friend, a mentor and the leading man. Everything changed. IDA: As you've screened Digital Dharma—whether on the festival circuit, or in screening rooms, or in living rooms—how have audiences reacted to the film? What has been most surprising or unexpected about their reactions? during the film's dramatic turning point finally had the Lunchbox team feeling that the last six months of focus groups and adjustments had been worth it. How we felt about this epic tale is how the audience felt about the film. They had learned about one of history's most important cultural salvations and were in awe of its catalyst. DY: Arnaud Desjardins, Robert Gardner and Barbara Atti. screening August 10 through 16 at the Laemmle NoHo 7 in Los Angeles and will be screening August 17 through 23 at the IFC Center in New York City. For the complete DocuWeeksTM 2012 program, click here. To purchase tickets for Digital Dharma in Los Angeles, click here. To purchase tickets for Digital Dharma in New York, click here.